South Korea's finance ministry on Nov. 22 called on the Bank of Korea, the country's central bank to intervene into the currency market "boldy" to curb the Korean won's sharp rise against the U.S. dollar. Earlier in the day, Finance Minister Lee Hun-jai held a face-to-face meeting with the central bank Gov. Park Seung at a Seoul hotel, a rare case that sparked speculation that the currency authorities may step up intervention down the road. From the outset of Monday morning session, value of Korean currency against the greenback started to rise at 1,062.7 won to one U.S. dollar, up 6.70 won as of 10:30 a.m.Monday from the closing of Friday last week. Reacting sensitively to Korean won's appreciation, south Korean stocks fell Nov. 22 afternoon across the board. 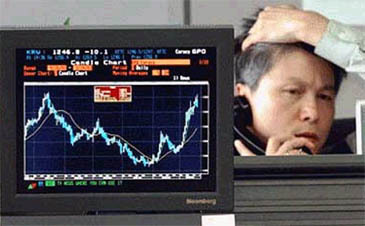 The benchmark Korea Composite Stock Price Index (KOSPI) fell 21.41 points, or 2.43 percent, to 845.62 as of 1:25 p.m., with the tech-rich KOSDAQ index down 4.22 points, or 1.13 percent, to 368.31. The persistently weakening dollar will certainly sap foreign demand for the country's products. That is why share prices of exporters led the decline.